Karen Davila challenged Chief Presidential Legal Counsel Salvador Panelo over some comments he made in a recent interview, in which he joked about f*cking his clothes and being "better in bed." Speaking to the Headstart host via phone on Wednesday, Panelo said that the writers of the said piece, Karin Wenger of the South East Asia correspondent of Swiss National Public Radio and local reporter Ana Santos, simply "did not get" his joke and that they misspelled the word "pack" as the f-word. "Actually... you know, in fact I was... because I received some text messages and forwarded to me an article they had written and I said to that writer that, obviously you did not get the joke because you were even quoting me wrong things. There was an interplay of words. Even the spelling was wrong. It's simply I pack my clothes. P-a-c-k. They spelled it incorrectly," Panelo said. Davila then read a portion of the transcript from the interview — first published by Preen — and peppered Panelo with questions. "I don't know how they could misunderstand if it's your voice. Your exact soundbite said, 'When I was still a bachelor, they said I f-u-c-k like an 18-year-old.' And then 'I f-u-c-k my clothes like an 18-year-old because I travel a lot.' Are you saying that this is misunderstanding?" 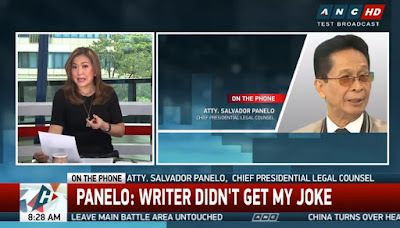 Davila asked, to which Panelo responded with, "They misspelled what I said. The word was p-a-c-k. As in packing clothes when you travel." When asked if it is appropriate to hear that kind of language from someone who represents no less than the Duterte administration, Panelo dodged the question and said that "people are already biased against the government." "So you feel you did nothing inappropriate by saying stuff like 'I'm better in bed'?" Davila asked again. Repeating his earlier response, Panelo said, "They quoted me incorrectly. Spelled even the words incorrectly," adding that Wenger and Santos just want to put him and President Rodrigo Duterte in a bad light. "When they were asking questions, there were obviously biased questions. They had already assumptions and conclusions," he added. Davila pushed: "Why would you say they are biased when you are the one who brought up very personal matters, jokes about being better in bed, using the word f-u-c-k in an interview?" Wenger in an email to News5 Wednesday said that Panelo's "sexual joke was inappropriate and uncalled for," adding that she felt offended "not just as a woman, but as a person." Below is the transcript of the interview courtesy of Preen. Karin Wenger: And one personal question: You play piano, right? Salvador Panelo: Yeah. I play by ear. SP: I compose, I play, and sing and dance. But I’m better in bed. KW: You’re better in bed? AS: How do you know? SP: Well, when I was still a bachelor, they said I f*ck like an 18-year-old. I f*ck my clothes like an 18-year-old. Because I travel a lot. KW: You f*ck your clothes? SP: You didn’t get the joke? I wanted you to laugh. KW: No. I missed the joke. I’m sorry. SP: Pres. Arroyo was telling me, because I visited her every once a week when she was incarcerated, and one time I went there and she was with her Assumptionista classmates. Apparently, they were talking about me. “Hi, ma’am.” “Hey Sal, they want to ask you one question.” “What is it, ma’am?” And then I sat down. And they said that “You don’t look your age, you look trim, you look strong. What’s your secret?” And my reply was so fast. I said, “Ma’am, I f*ck…my clothes. Because I travel a lot. And so they all laughed.